Ireland’s soccer team was one of 103 teams to participate in the qualifying stages of the 1990 FIFA World Cup Competition. By the time the tournament began on June 8th 1990 Ireland had qualified to play in the competition for the first time in history. 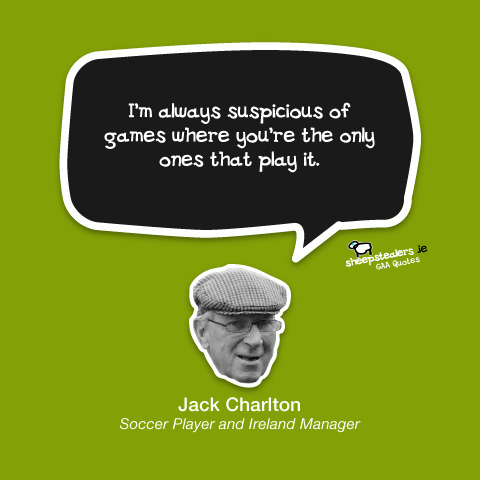 Two years previously Ireland under the management of Jack Charlton had qualified for Euro 88. In that tournament Ireland, who had beaten England, drawn with the Soviet Union, were defeated by the Netherlands. They did not progress beyond the group stages. Italy played host to the 1990 FIFA World Cup Competition. The opening game of the competition, usually referred to as ‘Italia 90’, for Ireland was against England. The game was played in Cagliari on the island of Sardinia. The game finished in a one-all draw. In the second game in the group stage Ireland and Egypt played a nil-nil draw in Palermo on the Island of Sicily. The final game of the group stages, which again was played in Palermo, ended in a one-all draw with the Netherlands. Ireland qualified from their group in second place and entered the knock-out stage where they faced Romania. The game against Romania, which was played in Genoa on June 25th, ended in a scoreless draw. In the ensuing penalty shoot-out Ireland won 5-4 and were through the quarter-finals of the World Cup for the first time. Ireland faced the hosts Italy in the quarter-finals at the Stadio Olimpico in Rome on June 30th. Italy were victorious courtesy of a goal from Salvatore Schillaci, usually referred to by his nickname Totò. 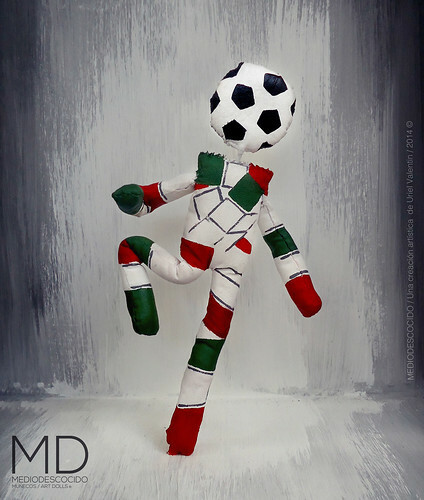 Despite the defeat, Italia 90 is Ireland’s most successful tournament to date. Italy defeated Ireland in the quarter-finals of the World Cup in the year 1990 On This Day. Carlow town is located in Southeast Ireland about 80km from Dublin. With a population of over 23,000 it is the twenty fifth largest urban area on the island of Ireland. Carlow town has frequently led the way in the provision of public utilities. By the early 1890’s the town had both a piped water supply (1894) and an electricity supply (1891). The water supply for Carlow town was first supplied from a reservoir at Killeshin about 7km west of the town. 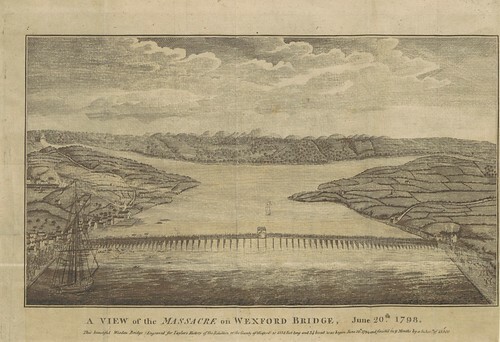 The reservoir was built on a tributary of the River Fushoge in the foothills of the Castlecomer plateau. The foundation stone for the reservoir was laid on September 5th 1894. The reservoir supplied water to households and businesses in Carlow town, for a small charge, for 99 years. The reservoir has been decommissioned and developed as a local amenity. 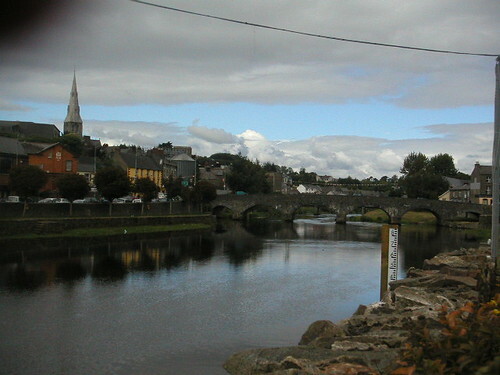 As Carlow continued to expand the demand for water increased. A new water treatment plant was installed at Sion Cross about 4km east of Carlow in the 1950’s. The treatment plant supplied water to Carlow from the River Burren. The Burren rises in Mount Leinster and flows into the Barrow near Carlow castle. As part of its quality control system the Sion Cross works used Fish Toximeter technology as an early warning system of water pollutants. The plant was extended in the 1970’s and by 2005 was supplying water to Carlow town and its environs at the rate of 4,000m3 per day. The demand for an improved water supply to Carlow town and its environs increased during the late 1970’s. This led to the construction of a new water treatment plant at Rahvilly on the River Slaney about 20km to the east of Carlow town. With a booster station at Friarstown, the Rathvilly water treatment plant was supplying over 4,000m3 per day by 2005. As a further boost to the water supply, wells have been drilled at Oak Park. The water from these wells together with the water from Sion Cross and Rathvilly is pumped to storage reservoirs at Brownshill and from there piped to Carlow town and surrounding areas. On April 29th 2014 responsibility for water services in Carlow was transferred from Carlow County Council to Irish Water. 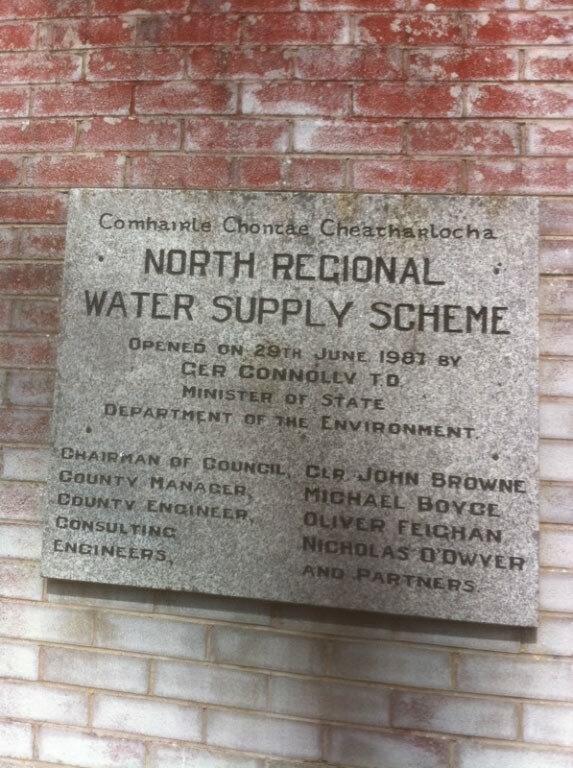 The water treatment plant at Rathvilly, which began began supplying water to Carlow in 1986, was officially opened in the year 1987 On This Day. Carlow Water Treatment Plant on the River Slaney at Rathvilly Co Carlow. Charles Stewart Parnell was an Irish nationalist politician who was describe during the 1880’s as the ‘un-crowned King of Ireland’. He was a member of the British Parliament from 1875 to 1891. 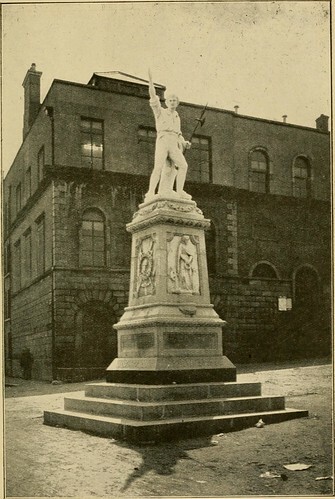 Parnell was a land reform agitator and the leader of the struggle for Irish Home Rule in the late 19th century. Charles Stewart Parnell was born at Avondale House, Co Wicklow in 1846. His father was a landlord. Parnell was elected to parliament for Meath in 1875 and two years later at the age of 31 was elected to lead the Home Rule Confederation. He became president of the Irish Land League which had been founded in 1879 by Michael Davitt. With Parnell as President and Davitt as one of its secretaries the Land League led opposition to eviction and set out to make landlordism unworkable. During the Land War from 1879 to 1882 it pursued three aims for tenants, fair rent, free sale and fixity of tenure. It led opposition to evictions and brought about reductions in rents. The campaign by the Land League would eventually lead to Land Acts being passed which allowed tenants to purchase their land. 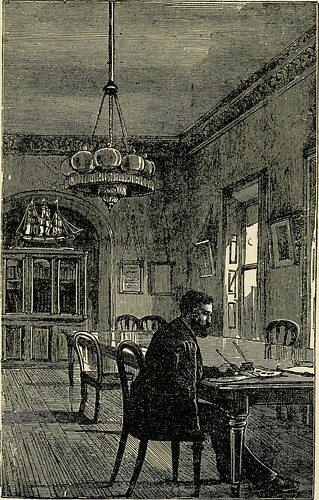 In 1882 the Home Rule League became the Irish Parliamentary Party with Parnell as President. Following the election of 1885 the Irish Parliamentary Party held the balance of power in the Westminster Parliament. This led to the introduction of the first Irish Home Rule Bill in April 1886. Parnell continued to lead the Irish Parliamentary Party until 1890. In that year Parnell’s adulterous affair with Katherine O’Shea, wife of Captain William O’Shea MP for Galway became public. This resulted in widespread condemnation of Parnell by some members of his party, the Catholic Church, British politicians and the Prime Minister. Parnell was removed as leader of the parliamentary party. He continued to lead the section of his party which remained loyal to him. In June 1891 he married Katherine O’Shea and later campaigned for his candidate in a by-election Carlow. He died at the age of 45 on October 6th 1891. Parnell was buried in Glasnevin Cemetery in Dublin. His funeral in Dublin was attended by over 200,000 people. 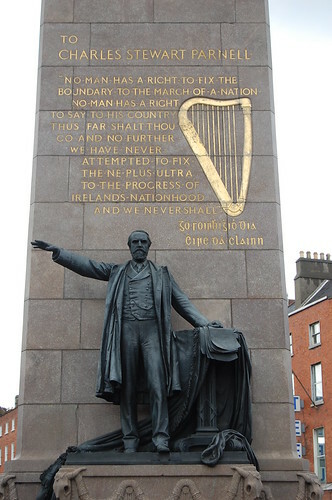 Ivy Day (Lá an Eidhneáin) is held each year in memory of Charles Stewart Parnell. It commenced on the first anniversary of his death and has continued to this day on the Sunday nearest the date of his death. Charles Stewart Parnell was born in Avondale House Co. Wicklow in the year 1846 On This Day. John Fitzgerald Kennedy, the 35th President of the United States of America, paid an official visit to Ireland in 1963. He was the first serving US President to visit Ireland. Before visiting Ireland President Kennedy has visited Berlin where he delivered his ‘Ich bin ein Berliner’ speech. The President spent four days in Ireland and huge crowds greeted him everywhere he went. During his visit he became the first foreign leader to address the Houses of the Oireachtas. The visit by President Kennedy to Ireland in 1963 was his sixth time to visit the country of his ancestors. His first visit was in 1939. On that occasion he came on behalf of his father to help with the arrangements for American survivors of the sinking of the SS Athenia. The ship had been sunk by a German submarine U-30 near Tory Island on September 3rd 1939. Many of those rescued were brought ashore in Galway. Kennedy later took a flight home from Foynes to New York. When he visited Ireland in 1963 President Kennedy was on a presidential tour of Europe. He arrived at Dublin Airport from Berlin on board Air Force One on June 26th 1963. Following meetings with the Irish President and An Taoiseach, President Kennedy travelled by motorcade to Dublin City centre. Along the route he was greeted by large enthusiastic flag waving crowds. The following day he travelled by helicopter to the County Wexford. 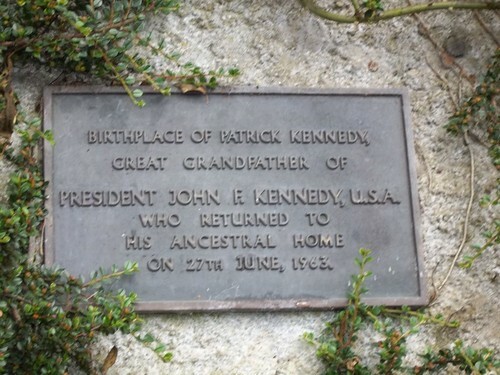 There he visited the home of his great grandfather Patrick Kennedy in Dunganstown near New Ross. His ancestor had emigrated to Boston in the 19th century. Kennedy had visited Dunganstown on one of his previous visits to Ireland in 1947. In Dunganstown, on this occasion, the President met with members of his extended Irish family at the Kennedy homestead and enjoyed tea and refreshments. Afterwards President Kennedy delivered a speech in New Ross to a huge crowd. In the speech the President joked that he could have been working for a local business had his ancestor not emigrated. The speech he delivered on that day in New Ross can be read on a plaque on Charles Street Dock in the town beside a bronze sculpture of the President. During his visit The President mingled with the people and even joined with a children’s choir to sing ‘The Boys of Wexford’. He later visited the town of Wexford where he laid a wreath at the statue of Joh Barry, Commander of the American Navy. During his visit to Ireland, President Kennedy also visited Cork, Galway and Limerick before departing from Shannon Airport, for a visit to England, on June 29th 1963. 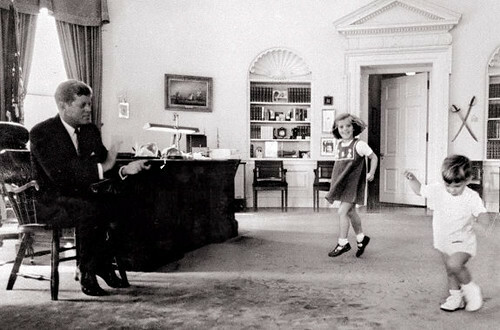 Five months after his visit to Ireland President Kennedy was assassinated in Dallas Texas. John Fitzgerald Kennedy, President of the United States of America, visited Dunganstown County Wexford in the year 1963 On This Day.